I’m doing a tv appearance this morning – Mark and I will be on The 700 Club bright and early. They invited me to talk about adoption, and as such I wanted to re-post some resources in case people come by looking for more information. I’ve written pretty passionately about the global orphan situation recently, and several people have asked: “What can I do if I’m not in a position to adopt?” Adoption is not for everyone. Nor is it the answer to the world’s orphan crisis. In the best of circumstances, adoption creates a loving family for a child who has been orphaned. But it does not address the root causes of why a child has been abandoned or orphaned to begin with. It is a band-aid on a much larger problem. It is estimated that 99% of the world’s orphans will not be adopted. Adoption is an answer for some orphaned children . . . but not for most of them. There are two sides to the orphan crisis: finding families for children without, and preserving families that are intact. Prevention is the side that is not addressed by adoption. If we profess to care about orphans, then we must care about the circumstances that lead children to be orphaned. If we care about adoption, then we must care about seeing less children enter orphanages to begin with. It is not as easy to care about the pregnant teen or the struggling mom. But it might be the starting place in this whole scenario. (And if we care about orphans, then we must care about the children in foster care in our own country.) I am so glad to see adoptive parents championing these issues. But this should not be a cause left to adoptive parents. As a society, we should all care. A child without a family is the most disgusting form of poverty. So, here are some of the ways that everyone can get involved in caring for at-risk children. The first is a list of things you can do locally (another great list is at Saddleback’s website). Then, I’ll give some resources to organizations that are on the ground in impoverished nations, that you might thing about supporting. Call your local Department of Child and Family Services and see how you can help. Most DCFS branches are overwhelmed with the amount of children in the system. Some counties have an “adopt-a-social-worker” program where individuals act as “finders” to help with family preservation. For example, if a social worker is trying to keep a child in a home where there is inadequate provisions (i.e. a crib, diapers, formula), the “finder” would assist with finding donations that match the family’s need so that the child is not removed. Become a CASA worker – Court Appointed Special Advocates are community volunteers who act as a voice in court for abused and neglected children. CASA volunteers get to know the child and speak to everyone involved in the child’s life, including their family members, teachers, doctors, lawyers, social workers, and others. The reality is that social workers do not often have the time to do this, so judges rely heavily on the information they gather. CASA volunteers commit to a child until the case is closed and the child is in a safe, permanent home. Become a respite care provider – Respite care is the short-term care of a child which enables foster parents to take a break. Some children’s needs require round-the-clock intensive care and parents need some time away to recharge. Sometimes respite is provided so that foster parents can take a vacation (most foster children are wards of the court and cannot leave their state). Foster parents cannot simply leave their children in the care of a babysitter or relative – the caregiver needs to be licensed with the county. Becoming licensed to give respite care offers a huge relief to those in the trenches and allows foster parents to do what they do without burning out. Consider adopting a teen who is aging out – There is something profoundly heartbreaking in reading the photolistings of children who have turned 18 and who, despite being old enough to live independently, place themselves on national photolistings because they desperately want a family. Many of these teenagers have college plans or career aspirations and are really looking for the moral support of a family as they enter adulthoood. Everyone deserves to have a consistent place to land for the holidays, rituals, and celebrations in life. Maybe you have that to give. If you visit adoptuskids.org and sort by age, you will find many young adults searching for a family to call their own. (pictured: Annette and Norma, “18-year-old twin sisters with dreams of having a family of their own and a sense of belonging. Both girls want to attend college and talk of being a lawyer or a doctor down the line. While they have each other, the one thing that is lacking in their lives is a permanent place to call home.” – The Los Angeles Heart Gallery. Get involved with Orphan Sunday at your church. Orphan Sunday is your opportunity to rouse church, community and friends to God’s call to care for the orphan. It is a great opportunity to recruit help and raise awareness for the various relief organizations listed below. Volunteer for a local group home – Group homes are difficult places. There are so many needs that can be filled. You could help raise money for clothes, shoes, backpacks, and other supplies. You could mentor a teen who is aging into adulthood. You could tutor students who are struggling in school, or make regular visits to play with children who are in the difficult season of temporary care. Lend a hand to families who have adopted – Do you know someone who has adopted an older child? Chances are, they are exhausted, both mentally and physically. Maybe even barely hanging on. Think about lending them a hand with whatever tasks are overwhelming for them, so that they can get a little break. I remember when we were still foster parents for Jafta and dealing with the DCFS hearings and the adjustment to life with two kids, that a group of people from Newsong Church came and painted our fence. It was one of those total random acts of kindness but it meant so much to have someone care for us in a tangible way, in the midst of that difficult season. Start a mentoring group for moms with kids in the system – This is one of the most unique ministries I’ve seen at my church: a group of moms (many of them foster moms) started a bible study with the biological mothers of local foster children. They mentored them, prayer for them, and encouraged them in their reunification efforts. The Adventure Project launched its “Grow” Campaign to support affordable irrigation pumps for rural farmers in Africa. 80% of the poor in Africa are rural farmers. 75% of their children are hungry. These revolutionary irrigation pumps are effectively moving thousands of of families out of poverty. The organization released a new seeded greeting card to support the Grow campaign. The card is embedded with wildflower seed and can be planted in the ground by the recipient. Mercy House is loving home for teenage girls in Kenya. It will be a supportive, safe place for them to get prenatal care, counseling, and to have their baby. It will give their baby a chance at life, to be raised by a mother who is learning skills and self-sufficency or by a local Christian orphanage, whichever she chooses. 31 Bits helps women in Uganda earn their own living by making necklaces out of recycled paper. I am a huge fan of 31 Bits (and not just because it was founded by some graduates of the university where I teach, and not just because the necklaces are awesome). 31 Bits is giving women a chance at providing for herself and her family. The name comes from the Bible’s Proverbs 31, which describes a woman providing for her family. The "bits" refers to the bits of paper from which the beads are made. Heartline Haiti Women’s Program – This is a program so close to my heart because we adopted Kembe through this organization. Each week over 100 women come through the Heartline center as part of their various programs. Women who have never earned a dollar in their lives are now earning money as they sew. Women who had no parenting skills are now taking better care of their children. Women who could not read and write are now learning. Women who have had no prenatal care are getting the attention they so desperately need. The birthing center is now open so these women can deliver their babies in safety. Women are becoming self sufficient and working to provide for their families by making purses. Parental Care Ministries is providing food, shelter, clothing, and education for at-risk children in Uganda, with a focus on children orphaned by the AIDS epidemic. Amazima Ministries operates a sponsorship program for 400 orphaned children. These children are provided an education, school supplies, 3 meals a day, and medical care. Another aspect of Amazima is the feeding program provided to the displaced Karamojong people of the Masese community. These people are Uganda’s poorest and often considered outcasts. A lunch meal is served to over 1,200 children Monday – Friday and a plate of food is sent home for dinner. This allows the children to attend school and not go to the street in town to beg. Real Hope For Haiti Rescue Center – I’ll let these pictures by Licia speak for themselves: WEEK #1 WEEK #2 WEEK #3 These four little girls lives are being changed by Medika Mamba. The Rescue Center takes in children in dire need, nurses them back to health, and then returns them to their family. They are doing life-saving work in Haiti every single day. Help End Local Poverty (HELP). HELP is a global tribe dedicated to ending extreme poverty by helping to rescue orphans, restore their hope and renew their communities. From their website: “There are children all over the world who live completely alone every single day – with no one to love them or care for them. we don’t believe that they were meant to live in dumps, fields, alleys or streets. 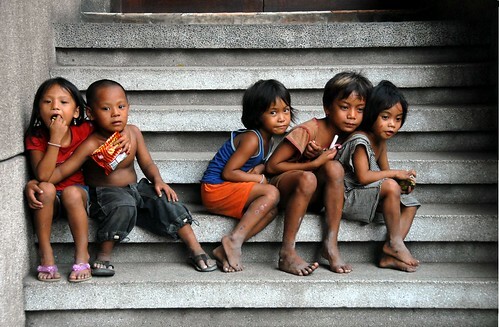 They have been abandoned, mostly due to AIDS, war and extreme poverty. We can do for them what God did for us: rescue them from poverty, give them a place to belong, provide a community of love and support, and give them opportunities for a future. We will build children’s homes that will be run by local leaders who will love these kids, help raise them, and prepare them to overcome poverty.” Garage Sale For Orphans – Garage Sale for Orphans is an initiative of Help End Local Poverty. It’s pretty simple. Sell anything that you don’t need or want, and that you are willing to sacrifice. Then, give the proceeds of the garage sale to help rescue kids in places like Haiti, Zimbabwe and Uganda. You can even­ choose which country and project you want to donate to directly on their website. Poverty Unlocked is an amazing podcast that explores the different avenues of care for global poverty. It offers an in-depth look at Christian relief and development. Food for the Hungry is a comprehensive mission organization that comes alongside impoverished people in their own communities, helping and equipping three arms: Leaders to solve problems in their community, churches to meet the physical and spiritual needs in their community, and families: To meet the physical and spiritual needs in their family. They offer many sponsorship opportunities. A Glimmer of Hope is a non-profit organization that helps lift women and children out of extreme poverty in rural Ethiopia. Glimmer developed an entrepreneurial model to provide clean water, schools, health clinics, and micro-finance loans, one village at a time. Krochet Kids offers 3 year programs to women living in poverty. In this program, the women learn to krochet hats to earn an income and be able to fully support themselves for the first time in their lives. Based in Uganda, my friend Sarah and her family are moving in a few months to start Krochet Kids in the country of Peru. Prison Fellowship’s Angel Tree helps connect parents who are in prison connect with their children. Zeway Orphan-Headed Household Partnership provides assistance to orphans who are raising their younger siblings, including three meals a day, social worker visits for grief counseling, and health care. The Abba Fund, Show Hope, and Lifesong for Orphans are organizations that raise financial support for families who are adopting. Maybe you have a heart for adoption, but it isn’t right for your situation. Adoption costs are astronomically expensive, and many willing families just cannot afford the fees. Helping others to finance their adoption is a way to play a part in giving one child the hope of a family. We were very blessed to receive a grant from Show Hope to offset the debt from Jafta’s adoption, and from Lifesong for Orphans and our church (Rock Harbor) to help pay for Kembe’s adoption. We are incredibly grateful that other people helped to bring Kembe into our family in such tangible ways. Watoto is a holistic childcare ministry that exists to raise the next generation of Ugandan leaders through improving academic skills, moral values, and health. Watoto is caring for 2000+ orphaned children tin three Watoto Villages in Uganda. photo by Esther Havens Riverkids aims to prevent the sale and exploitation of children, to find non-exploitative labour alternatives for children and families, and to transform families and communities as low-risk for child trafficking and exploitation in rural Cambodia. World Orphans seeks to rescue millions of orphaned and abandoned children through the involvement of the indigenous church. Their goal is to partner each local church with a US church that can commit to providing resources and support. These are just some of the many, many relief organizations doing hard work on the ground, who need help and support to keep their relief mission going. They are all effecting change at the societal level, and giving care to children and dignity to families. It is the best of our humanity when we acknowledge the suffering of another, and we make the changes necessary to do something about it. But in order to bring about societal change, we need to talk about the realities of poverty. We need to educate others, and motivate those holding the privilege to step up and help those who have nothing. I know there are many, many more ways that people are mobilizing to care for orphans. If you know of some ideas or organizations, leave them in the comments. I would love to think that our current generation will sacrifice and work together to ensure that every orphan receives his or her basic human rights: food, shelter, clean water, and the love of a family.